Minister Corey Smith, Anointed Dancer! Brother Corey Smith is a powerful African American Male. A living statistic! One who loves God and has broken into the depths of his true gifting. He is a proud Minister, brother and friend. His willingness and humility is priceless. His passion for God and love for the arts has catapulted him into the specialty area of Choreography & Urban Street Dance. 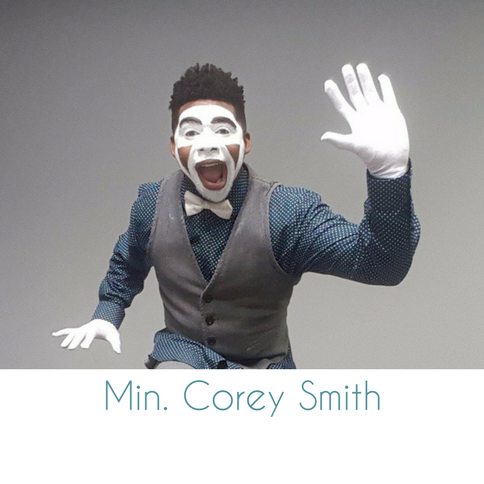 He not only embraces the heart of God, he also embraces the heart and dynamic of Mime Ministry. The stories that unfold from his non-verbal mime moves fall upon the heart of those who dare chose to receive. He wants everyone to understand the method of his praise and joy of his worship. He believes that the youth of the 21st century should have an outlet of expression from the eyes and rhythm of their hearts. His radical cry for this generation demonstrates a “voice” and a “stand” against all odds. He is truly an example of a determined, focused young man who loves and honors God. The salvation that Christ has offered and the evidence of the Holy Spirit is what guides and teaches him to live. This combination is what makes the ministry he shares possible and relative to our youth. Brother Corey believes he is of a chosen generation, of a royal priesthood, from a holy nation. All which is acceptable and honorable in the eyes of almighty God! He has performed and ministered with numerous groups. The list begins with Actors for Christ, Special Forces, The Untouchables, Trakk Team, Sold Out,& Anointed Flames. Brother Corey Smith has used his gift on Positively Oak Cliff for Clarice Tinsely, the Half Time show for the Dallas Fury Professional Women’s Basketball team, National Recording Artist, Dooney and the Peculiar Records Crew, Aquire The Fire Youth Conference, Fred Hammond's Christmas..Who Needs It..The Stage Play and also J.D Lawrence & Fred Hammond Cain & Able The Off Broadway Stage Play and also host of other venues.